The Wild Dog Alert ‘SMS 4G camera trap system’ has been turned on for testing, and in its first night has identified and alerted researchers to potential predators. 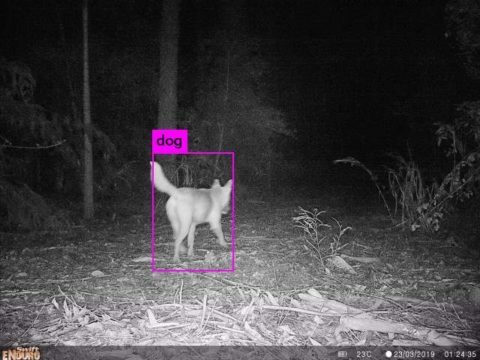 The digital system has brought innovation to the forefront using an off-the-shelf camera trap to take a photograph and send the image to a cloud-based portal, which uses a complex algorithm to identify wild dogs. Dr Paul Meek from the NSW Department of Primary Industries (DPI), who is leading the project said this result has been years in the making. “While it is early days and more testing needs to be done, we are very excited to have proven the system can work. “We are now working to iron out any potential bugs and refine the system as we go,” Dr Meek said. The Wild Dog Alert project began back in 2016 and is being led by researchers at the University of New England (UNE) and NSW DPI. The Development team at UNE led by Dr Greg Falzon have produced three versions of the system – one using an automated Wild Dog alert system, one using a Buckeye Camera trap system, and this one using the SMS 4G camera trap. Andreas Glanznig, CEO for the Centre for Invasive Species Solutions said that this innovation has the potential to give land managers an important early warning system. “The system could enable livestock producers to react promptly to a wild dog sighting and undertake real-time management. “Just as importantly, it could also inform larger management programs to enable optimal placement of baits or traps. We look forward to seeing this technology progress and develop,” Mr Glanznig said. Dr Meek said the team is already thinking about next steps. “We are considering the technology’s potential with other species such as foxes or feral cats, for example removing the remaining feral cats on Kangaroo Island could be enhanced by adoption of this type of technology. “We are also trialing another camera trap system that uses VHF communication and one using the Iridium Satellite system to achieve the same outcome in areas where telecommunication may not be available,” Dr Meek said. The Wild Dog Alert project is led by researchers at the NSW DPI (Dr Paul Meek) and UNE (Dr Greg Falzon) and funded by the Australian Government Department of Agriculture and Water Resources, Australian Wool Innovation and Meat and Livestock Australia through the Centre for Invasive Species Solutions. 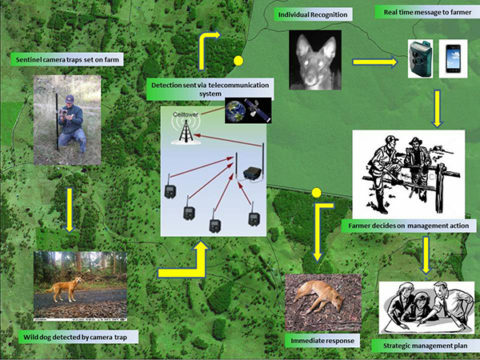 The Wild Dog Alert system brings together significant research developments in automated facial recognition of wild dogs (based on camera trap imagery), the latest in digital communication tools (suitable for remote transmission of image data and real-time alert messaging) and the understanding of wild dog movements and behaviour. Testing has shown image transmission times between the 3 models of camera trap are less than one minute. On average the time from detection to SMS delivery is 25 sec, with some variability between models. Satellite signal reception has proven to be impressive across the landscapes tested. However, as expected signal transmission in 100% rainforest canopy cover is problematic and further tests are planned with antenna modifications to assess limitations. The Wild Dog Alert system is also being integrated with Wild Dog Scan to allow planning modules between producers and land managers.